A moment; a movement; a mood. In Elena’s art, the ephemeral is made permanent in watercolours, acrylics, charcoal, sanguine, graphite and pastels. In fact, there is no escaping the emotion that crashing waves and stolen glances can instil in us when laying eyes on one of her creations. Elena sketches and paints pictures of people anywhere she may be, from parks to swimming pools, and from cafés to public transport. And it’s their expression of humanity that often captures her attention and inspires her to create. That ideology is particularly personal for Elena, whose successful, international career in art actually followed a process that saw her move away from what she was born to do. Indeed, while she graduated from Irkutsk Regional Youth Art School in Russia with a certificate of excellence, she went on to do two Master degrees in language and literature, and then to work as a teacher and translator in various European countries for 15 years. “My parents always encouraged me to get a ‘proper’ education but, while I loved my job, I felt I had too many ideas of my own… The urge to express them simply became too strong for me to resist,” she reveals. It was while living in England – 20 years after she had graduated from art school – that Elena finally joined a local art society and started exhibiting with them. Less than a year on, her watercolour Café in Barcelona won the art society’s Annual Exhibition Award for the most innovative artwork at Norden Farm Centre for the Arts in Maidenhead. This passion for people and the array of emotions and feelings they exhibit continued to grow as she carried on painting and exhibiting in various European cities. But it was Malta’s seas that pushed Elena out of her comfort zone to depict something new, vast and very abstract. “My attitude towards the sea has always been the one of awe and fear, most probably due to a childhood accident when I almost drowned,” she recounts. Having moved to Malta due to her husband’s work, Elena found herself surrounded by something that made her anxious; something so big and omnipresent that she could not escape. Since then, Elena’s seascapes – with their greens, blues, browns and whites that completely engulf the senses – have become one of her signature genres. And whether she’s painting the sea en plein air or in her studio, it still follows the same ideology that her portraits do. This is also clear in the titles of Elena’s marine artworks. 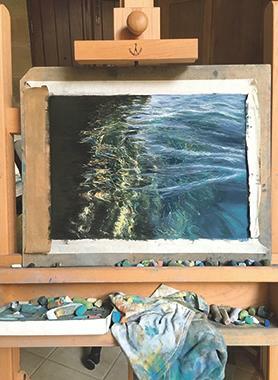 Among these are Between awe and fear, Immersion and her current series of sea water paintings, Meditations, one example of which was recently exhibited at the Mall Galleries in London as part of the Royal Society of Marine Artists annual exhibition, as well as in Malta for part of an exhibition by the Pastel Society of Malta. 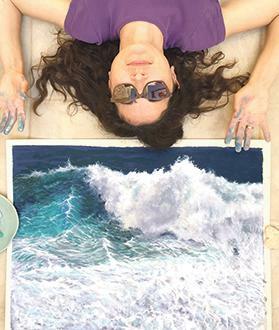 Talking about Meditations, Elena explains how she wants her marine paintings to make viewers start appreciating [the sea’s] fragile beauty and taking proper care of it. Yet I couldn’t help adding that even her portraits venture into this mindset. Caught off-guard and often mid-thought, Elena’s human subjects remind us of how fragile we all can be in those rare moments when we let our guards down; when we think no one’s watching, seeing, judging. There’s no doubt that we’ll be hearing more about Elena as time goes on. 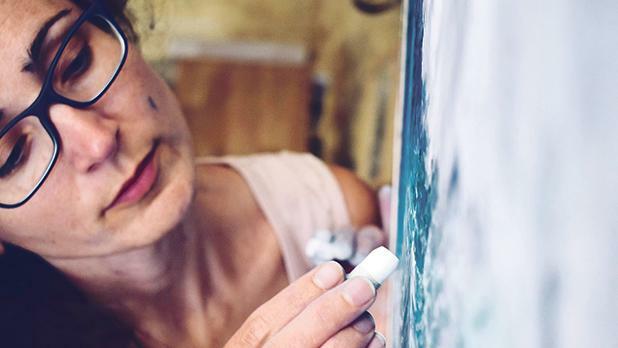 Indeed, she’s already been part of numerous exhibitions in Malta, including the multi-sensorial exhibition Perception, which was organised by the Malta Society of Arts, as well as Allura Art Trail, a walking tour of pop-up artists’ studios across Sliema and St Julian’s. But outside of art galleries and art exhibitions, Elena is always to be found wherever the sea and people take her – making the most of that which we’re so afraid to show to the world so that she can share it with the world and remind us that we are all in the same boat.